You can read our post summarizing everything new we learned at the Model 3 event here and our exclusive leaked specs of the unannounced higher-end version of the Model 3 here. 01/04/16 – 10pm PT – 1am ET: Musk updated the number again in the evening to 232,000 Model 3 reservations. 31/03/16 – 11pm PT – 2am ET: Tesla kept a count of incoming reservations on a screen at the Model 3 event. 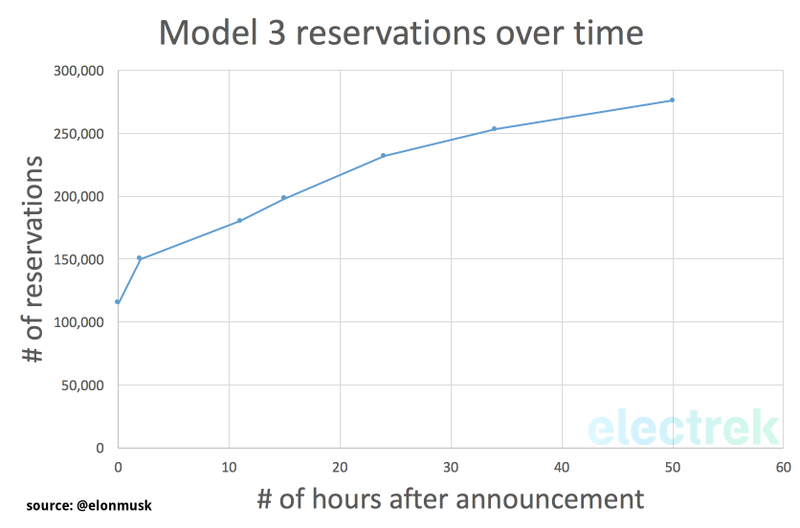 Toward the end of the evening, Tesla had around 150,000 reservations. 31/03/16 – 9pm PT – 12am ET: After the end of his presentation, Elon Musk announced that Tesla already accumulated over 115,000 Model 3 reservations with deposits – those reservations were mostly sight-unseen.